Uncle John the Puppeteer performs Puppet Shows in New Jersey for children's birthday parties, preschools, libraries, daycares, elementary schools, camps, corporate events, fundraisers and more. He uses muppet style hand puppets, including popular, well-known TV & movie characters that kids already recognize on a daily basis. In addition he can uniquely perform the voices of 30+ puppets to make them truly come to life! Uncle John will be at your party a minimum of 2 hours and charges a flat rate. Every performance includes a mini-magic show and dance party included in addition to the main puppet show. Uncle John is a professional, insured, full-time puppeteer who has been performing puppet shows for over 20 years. Uncle John's Traveling Musical Puppet Show provides traveling NJ puppet show party entertainment, each puppet show including a mini-magic show and dance party. Uncle John is at an event for at least 2 hours and charges an all inclusive flat-rate.Uncle John Travels to most of the New Jersey area. In a rush? Call 908-508-9292 for more information and real-time date availability. Click here to fill out a quick form for more information. I perform Puppet Shows in New Jersey for children's birthday parties, preschools, libraries, daycares, camps, corporate events, fundraisers and more. I use muppet style hand puppets, including popular, well-known TV & movie characters that the children at the party already recognize on a daily basis, not unknown marionettes. To keep the children's attention, the puppet show is organized in a fast paced stand-up comedy format and the puppets make the effort to know ahead of time who's who in the audience so they can interact & joke with them during the puppet show. For birthday parties, I have the birthday child perform some easy & classic magic tricks, making them the star during the initial magic show. Through sleight of hand, no effort on their part is required! 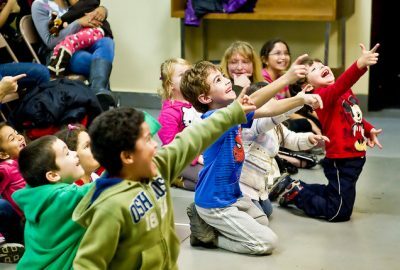 After, Uncle John the Puppeteer introduces the kids to his realistic animal puppets & performs the puppet show, followed by a kids dance party, complete with popular music & party favorites. After years of experience, I am able to mimic the exact voices of popular, well-known T.V. & movie characters. This gives an extra layer of authenticity to the puppets when they interact with your audience. Using a custom stage & one-way curtain, the children often forget they aren't actually interacting directly with the puppets! Children never tire of a constantly evolving & interactive puppet show that uses over 40 popular television, movie and cartoon puppet characters. The show moves so fast, that it often takes multiple viewings to catch all the humor and jokes that you might have missed the first time! For more information regarding Uncle John's puppet show, please call (908) 508-9292 or contact him via the information & call-back form for more information & a quick call-back from Uncle John. A similar, educational format is followed for schools, camps and libraries but with a health and safety theme. Contact Uncle John the Puppeter today for more information regarding preschool puppet show programs and special puppet shows for day-cares & libraries. 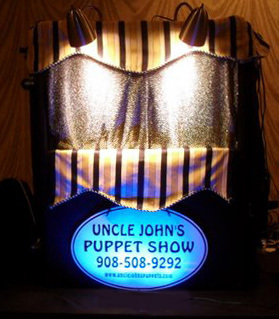 For more information regarding Uncle John's birthday party puppet shows, please call (908) 508-9292 or contact him here for more information & a reply personally from Uncle John. The feedback about your show was overwhelming… We had the largest attendance on record… your entertainment put smiles on everyone’s faces… kids, adults, and dogs! We have used Uncle John’s Puppets for the past 16 years for our Annual Halloween Bash. His show never disappoints. He is simply the best there is! I can’t believe you’ve been coming here to do your puppet shows since 1991… We’re looking forward to your appearance again in 2008! I’m sure you could tell the kids and moms enjoyed your show tremendously.. we laughed, danced and sang! Thank you for a morning of pure childhood entertainment. The Students at the Beechwood School in Mountainside loved your show… we hope you can come back real soon! In a rush? Call Uncle John anytime at (908) 508-9292 or submit his inquiry form for information & a reply ASAP personally via email or phone.